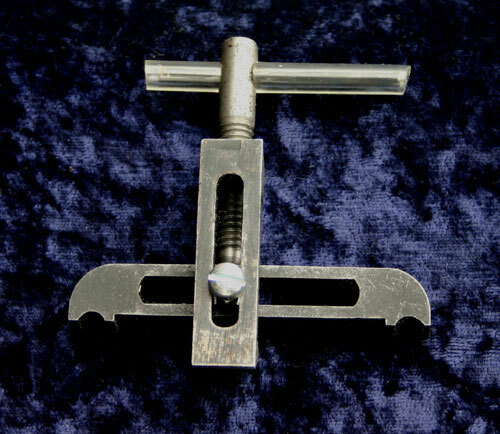 This lock spring vice fits all frizzen springs & main springs, left & right handed, from the largest to the smallest. Design eliminates struggling to clamp spring & tighten vice. Four way slide to fit any size mainspring or frizzen spring. Arm recessed for frizzen spring screw hole and recessed nut slides in guides completely out of the way. Made of heat treated 6150 tool steel with sand blast finish. High leverage bar, no more using pliers to tighten a tiny thumbscrew.